MDC Alliance principal Tendai Biti. EMBATTLED MDC Alliance co-principal Tendai Biti was deported from Zambia last night and was set to appear at the Harare magistrates' court this Thursday afternoon. But even after successfully reaching Zambian territory, authorities in the northern neighbour refused him asylum on that the grounds of his application were "weak". 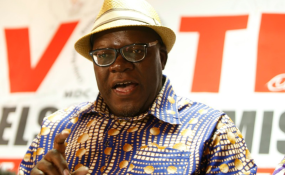 "Biti has been removed from the Zambian soil and has been formerly arrested by Zimbabwean authorities," Biti's Zambian lawyer Gilbert Phiri told NewZimbabwe.com Thursday, adding, "I am not sure of the charges against Biti at this moment though." Biti has been in hiding since last week when wild skirmishes broke out in central Harare over the MDC Alliance's electoral defeat by Zanu PF. "Despite us obtaining a court order to stop the deportation, the authorities of both countries have failed to abide by their constitutions and worked against the law to deport our client. "A court order has not been set aside to allow hearings to proceed before a court of justice in Zambia and we are taking action against the officials who have ignored this order and deported Biti back to Zimbabwe."